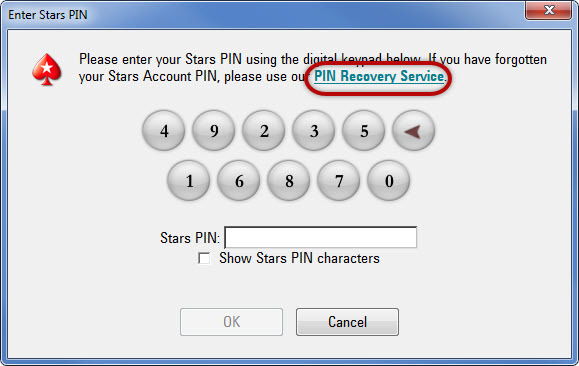 If you forgot your Stars PIN, you can recover it using our Stars PIN Recovery Service, and an email with your Stars PIN will be sent to your registered email address. Load our software on your computer. Enter your Stars ID and password in the appropriate place. Click on Stars PIN Recovery Service. Your Stars PIN will be emailed to the email address associated with your Stars Account. If you have your mobile phone validated in your account, your Stars PIN will be sent via SMS. What is your registered date of birth? What is your registered phone number? Please mention a previous deposit/withdrawal method that you have used on your Stars Account. Provide the Stars ID of a player to whom you have transferred funds or that has transferred funds to you. Any additional information that may help us verify ownership (e.g. previously registered mailing/email address, approximate current balance, last login, an image on your Stars Account). If you feel you are unable to remember the answers to all of the above questions, then send us a clear digital photograph of your government-issued photo identification (passport, driver's license or national ID card), ensuring that the details are visible.